The book's plot details the struggles of a teenage chinese boy as he tries to prove his worth amongst others much stronger than himself. His quest is to become the newest Dragoneye, a controller of Earth and its natural happenings. However, Eon is secretly Eona, a sixteen year old girl. The punishment for a female using any magic is death. As, Eona is faced with a broken leg, difficulties with studies, and defeat after defeat, her secret slowly comes to the light. 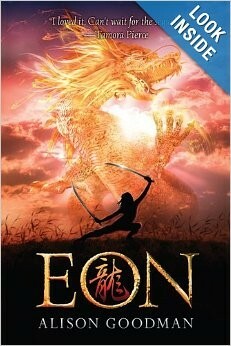 Thus, Eona must race to protect herself and her family. If she fails, she will be sent home where her family will witness her execution and be forced to cheer. While this occurs, a darkened soul of a Dragoneye, Lord Ido, plans to conquer the world by using his powers against all. The plot is, overall, quite suspensefull as Eona continuously gets herself into trouble and barely escapes punishment. Thus, with its high suspense amount, you will enjoy every page of the book. The plot also focuses highly on sexism with the main hero rising above all challenges regardless of her gender. Eona even wins many fights against men throughout the story, showing that Goodman, the author, has strong pride in girls being capable of anything. "Eon" is a mostly tame book throughout, as it tries to appeal to teenagers. However, the book can be slightly gory at times with its mentions of blood and sometimes bones shattering. But, this usually does not bother most of the book's demographic, thus making the gore not much of a problem. The book uses appropriate vocabulary throughout while subtley introducing readers to brand new words. Sometimes these words are purposely placed in areas to encourage readers to use dictionaries such as here:"You are wrong when you say there is no power in being a woman. When I think of my mother and the women in my tribe, and the hidden women in the harem... "(193) since most readers are unfimiliar with the word harem, they will have to look it up to understand the quote's message. Thus, the book does a good job of teaching teenagers new vocabularry while keeping it in their range. The book also can be used in a course. While the book is obviously fiction, it can be fit into a study of ancient china. This is due to the fact that the book discuses many of the chinese ancient rituals and beliefs. 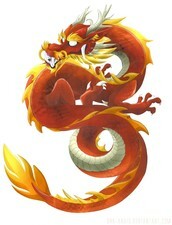 The book's protagonist among other characters believes the world to be created by twelve dragons, one for each month and emotion. These dragons also choose one person to have some of their power for a twelve year period, much like a pope. Thus, the book can help teenagers understand chinese religion in a fun way. The book recieved four and a half stars on Amazon.com with one review stating:"I hardly ever read straightforward fantasy, but every once in awhile a book comes along that blows right past all my usual objections to become a new favorite. As gently but strongly as a wisp of incense, Eon beckoned until I was completely in the thrall of its magic, and I hate to think how sad my life would be if didn't have this vividly imaginative novel in it." In Depth Review of "Eon"
This link provides a more detailed review of "Eon." -Many people say that this title is incredibly long and not worth the time. However, the book's constant state if action will keep you entranced for a long time. -Readers claim that the main character is a poor representation for a female hero. However, Goodman was aiming to make Eona struggle to demonstrate feminine struggle towards rights. -Critics have harassed the book on countless times due to its vocabulary. However, they overlook the fact that this book was aimed at teenagers. For an adult, the vocabulary is far easier than for an average middle school student. To conclude, this book is a must read with constant suspense, and thrilling moments. The book is also highly recommended for girls to read, as it highly advertises females with a passion. Also, due to the book's connection in a history class, it can be used nicely in order to understand difficult concepts. Thus, there is no reason not to put "Eon" on our library shelves now. "Eon." Amazon.com. N.p., n.d. Web. 06 Feb. 2014. Goodman, Alison. Eon. Oxford: David Fickling, 2009. Print. Kristen. 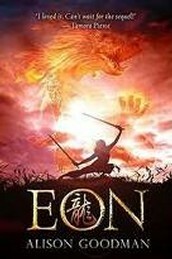 "Review of "Eon"" Fantasybookcafe.com. N.p., n.d. Web.